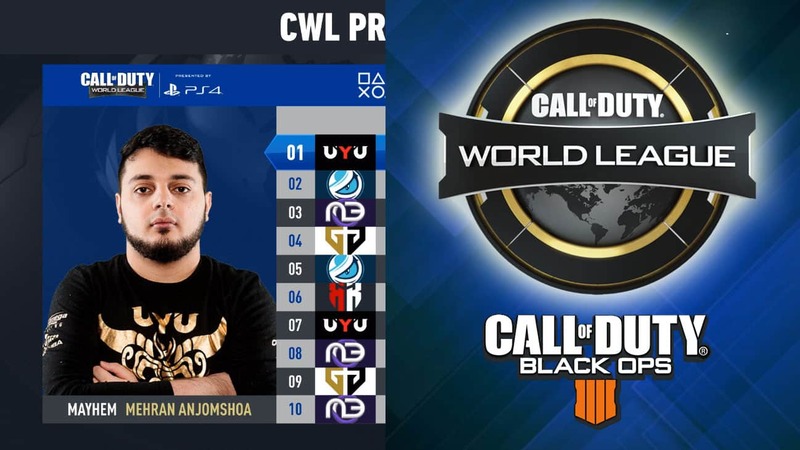 Day 2 of the CWL Pro League 2019 Season brought some interesting matches and results. After the opening day, we’ve seen Red Reserve on a path of destruction and Midnight upsetting OpTic Gaming. What would bring in day 2? Here are the highlights from the Highlights from CWL Pro League Day 2, February 5th. Day 2 of the CWL Pro League started off with Gen.G vs Red Reserve. Followed by Midnight vs Evil Geniuses, UYU vs OpTic Gaming and Luminosity vs Reciprocity. As usual, we saw some shocking results, and some dominating performances from individual players. Here’s everything you need to know about day 2 of the CWL Pro League. After Red Reserves convincing win against Reciprocity on opening day, fans were wondering if they were going to take that momentum into day 2 of the Pro League. 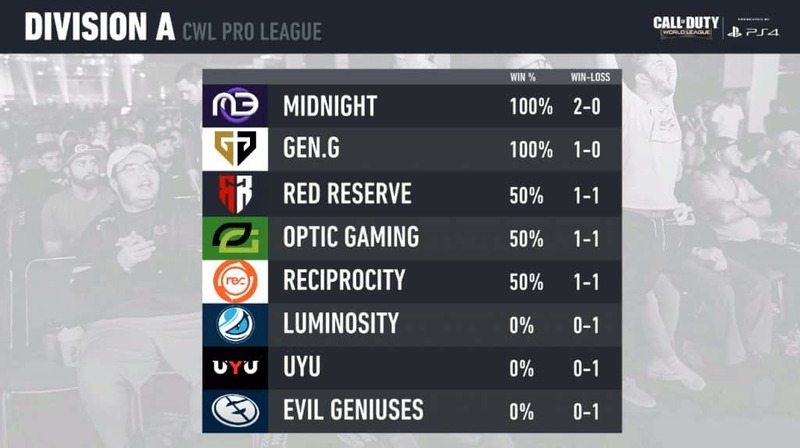 Gen.G were making their debut in the pro league. GreenWall fans were hoping for a turnaround after OpTic Gaming lost opening day. They were swept by Midnight in a shocking defeat. On day 2, OpTic Gaming had the chance to scrim with each other and get familiar with FaZe ZooMaa, who was replacing OpTic Dashy for now. In the first match, UYU came out strong, but ZooMaa has something to say about that and had two clutch kills to help seal the first match in Hardpoint for OpTic Gaming. OpTic Gaming and Zooma continued their dominance, showing the world that they are ready to start winning again and beat UYU in Search and Destroy. However, thing’s turned around for UYU. UYU fought back to take Control and the map 3-1 avoiding the sweep by OpTic. After losing the first day to Red Reserve, Reciprocity were hoping to change that around in day 2 against Luminosity. Day 2 would be the first for Luminosity Gaming of the Pro League. In the first match on Hacienda playing Hardpoint, Luminosity bounced to a convincing lead by almost triple to what Reciprocity had. However, things turned around with Zed getting some clutch kills to infiltrate key hardpoints. Rec had a nice comeback, taking away the first match from Luminosity Gaming. Match 2 went in favor of Reciprocity who beat out Lum in SnD with a 6-3 win. What looked like an impossible scenario for Luminosity showed a brink of light on the last round of elimination on Gridlock. Luminosity used up all their specials just to beat barely beat Reciprocity, This somehow worked and turned everything around, having Luminosity bounce back and win two matches in a row to tie the series. But Rec proved to be too strong, winning the last match and beating Luminosity Gaming. (Reciprocity Win). This is how the CWL Pro League leaderboards look lik after Day 2. 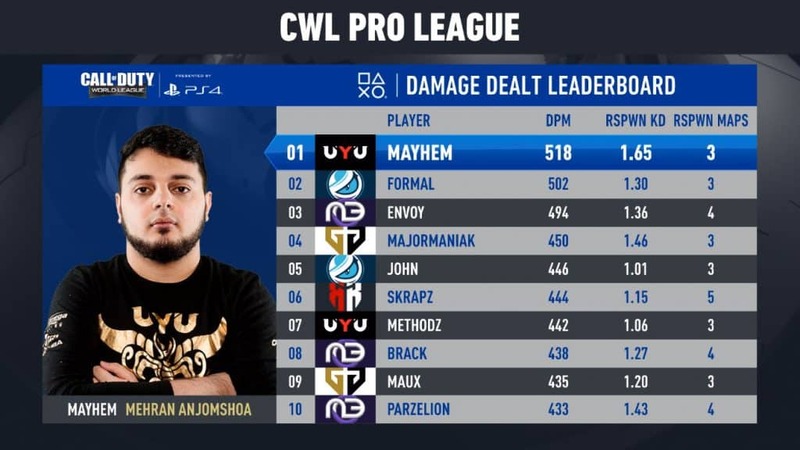 Damage dealt leaderboard report for Day 2 of the CWL Pro League. Mayhem (Mehran Anjomshoa) from UYU at the top with 518 DPM. He also had a 1.65 KD (the highest we’ve seen thus far). His performance against OpTic Gaming was impressive and earned him top spot of the Damage Dealt Leaderboards.